The term dysmenorrhea refers to painful cramps occurring before or during the menstrual period. The symptoms of dysmenorrhea include abdominal pain and pressure, hip and lower back pain, and inner thigh pain. Primary dysmenorrhea is a type of recurring menstrual cramps not caused by other diseases. The use of SP6 in acupuncture is highly defined and established. Indications for the use of acupoint SP6 in TCM are abdominal pain and distention, dysmenorrhea, irregular menstruation, uterine bleeding, leukorrhea, uterine prolapse, infertility, delayed labor, nocturnal emissions, enuresis, dysuria, lower limb disorders, vertigo from deficiency and insomnia. TCM theory states that SP6 benefits the spleen and kidneys, transforms dampness, and spreads the liver qi. SP6, roughly translated as three yin junction, is also the meeting point of the three lower yin meridians. Research supports using SP6 for the treatment of dysmenorrhea. Shi, et. 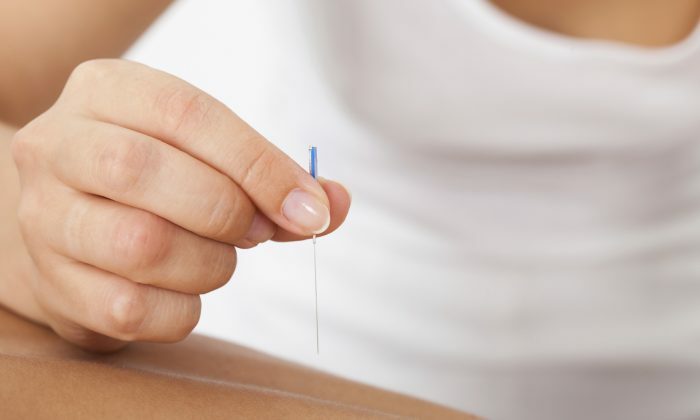 al., measured significant pain relief induced by needling acupuncture point SP6 for patients with primary dysmenorrhea. Blood samples were taken of participants during the study. It was shown that although acupuncture decreased menstrual pain, the beneficial effects were not related to changes in plasma levels of prostaglandins. The researchers conclude that the analgesic effects of SP6 are not mediated by prostaglandin variations in the bloodstream. Another study of 66 patients finds acupuncture, combined with cupping and moxibustion, effective for the relief of menstrual pain. 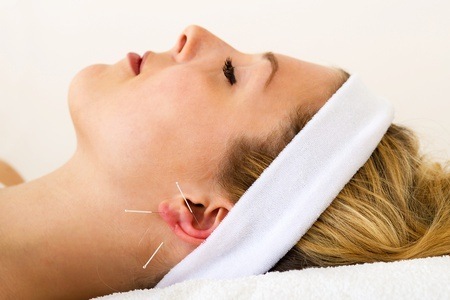 The patients had significant relief of menstrual pain within 2 – 6 acupuncture treatments. This study employed the use of SP6 and other acupuncture points: CV4 (Guanyuan), SP10 (Xuehai), K3 (Taixi), SP8 (Diji). Licensed acupuncturists often combine acupuncture with herbal medicine for the treatment of gynecological conditions. Research backs up this time honored approach to patient care. A high quality study finds acupuncture and Chinese herbal medicine effective for the relief of endometriosis related pain. The total effective rate for auricular acupuncture was over 90%. The total effective rate for Chinese herbal medicine was 60%. A closer look reveals that the effective rate for mild to moderate dysmenorrhea due to endometriosis for both auricular acupuncture and Chinese herbal medicine is similar. However, auricular acupuncture showed greater efficacy for the relief of severe dysmenorrhea due to endometriosis. The randomized, blinded controlled trial was of high quality and a laparoscopy was required to confirm the diagnosis of endometriosis. Zhou, et. al., find acupuncture combined with moxibustion and herbs is more effective for reducing menstrual pain and cramping than ibuprofen. The results were published based on research of a randomized investigation of patients with primary dysmenorrhea. Data points were taken at three, six and nine months after the beginning of treatment. The long-term positive clinical outcomes for patients having received acupuncture, moxibustion and herbal medicine was significantly superior to patients having taken ibuprofen. Research conducted at the Affiliated Hospital of Hubei College of Medicine and Pharmacy involved a trial of 90 patients with primary dysmenorrhea. The patients were randomly divided into two study groups. Group 1 received acupuncture, herbal hot compresses and moxibustion. Group 2 received oral administration of ibuprofen at 300 mg per dose, three times daily. The treatment lasted for three menstrual cycles. During the course of treatment, dietary restrictions were applied to both group 1 and group 2. Patients were advised to avoid eating raw, cold, pungent or very spicy foods. Patients were advised to increase their consumption of fresh vegetables and fruits. In addition, patients were advised to avoid prolonged exposure to cold temperatures on the lower abdomen. The total effective rate observed in the acupuncture group was much higher than that of the ibuprofen group. The hot compresses were applied to the umbilical region and local regions of pain on the lower abdomen. The herbal medicines in the compresses were Dan Shen 10g, Yan Hu Suo 10g and Yi Mu Cao 30g. The herbs were decocted for one hour and strained. A 10 cm x 15 cm flannel cloth was soaked in the decoction, removed and squeezed to remove excess fluid. The cloth was applied to the patient. One hot compress treatment lasted for fifteen minutes. Reinforcing and reducing acupuncture needle manipulation techniques were applied until a deqi sensation was achieved. Moxa was applied to needles. The needles were withdrawn after the use of 3 – 5 cones of moxa. The approximate treatment time was 30 minutes. Acupuncture, moxibustion and hot compresses were applied once daily for a period of six days. The treatment started one week before the menstrual period began and ended by the first day of the menstrual cycle. The treatment resumed before the next menstrual period. One course of treatment comprised one menstrual period and the entire treatment lasted for three courses. The acupuncture group significantly outperformed the ibuprofen group at three, six and nine months after the beginning of treatment. The results indicate that acupuncture combined with moxibustion and herbal compresses is safe and effective for the treatment of primary dysmenorrhea. By Cindy E. Levitz, M.S., L.Ac. Are you dreading “that time of the month”? If so, you are not alone.